I recently came across a study carried out by TLNT in 2013 which revealed the top two leadership traits to be communication skills and humility. This finding complements perfectly my own experience of job sharing and also those of others; one of the most common tips of successful job sharers like Cynthia Cunningham and Shelley Murray at Fleet Bank, is to “leave your ego at the door.” As I reflected on how it would be possible for organizations to help their employees prepare for this requirement to leave your ego at the door, I started to wonder just how much money companies spend on team building exercises. I decided to look into it so I could put into perspective current investment in leadership development. The closest figure I could find was published by Fresh Business Thinking, which claims the corporate hospitality sector is worth £1.5 billion in the UK alone. Also, a new study by TLNT shows investment in training is on the up again following a slump after the recession, with U.S. companies spending an average of $706 per learner in 2012. So clearly, organizations spend hundreds of thousands of pounds on “team building” days and workshops, which focus specifically on relationship building, communication, listening skills. But how useful are they, really, when it comes to putting into practice skills that have been tested outside the work environment? 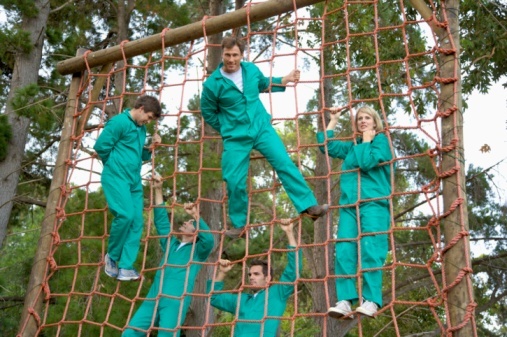 Are Team Building Activities Useful? Evidence suggests people place more value on open, collaborative, and flexible ways of working every day, than one-off out-of-office team building exercises. In other words, learning-by-doing in the work environment, rather than in an out-of-office scenario. So perhaps instead of breaking out from work into a new environment for a day before all returning to the same routines and communication issues, crucial leadership skills could be better developed by a requirement to successfully job share a role for a period of time, e.g. 12 months. Investing a proportion of a training budget in educating and effectively supporting a job share initiative would offer new learning and communication requirements “on the job”, whilst opening up leadership development opportunities that work hand in hand with flexible working strategies. Surely that would be a more effective way to spend a training budget? I’m still not clear on why this isn’t already the case; perhaps it’s because people consider job sharing as only part-time. If you’re considering job sharing exclusively as a part-time flex strategy, stop now! It doesn’t have to be restricted to an option for those looking for reduced hours, although it is a great strategy for that. Personally, I have carried out a job share whilst working full-time; not because I reduced my hours, but because the role itself was more than full-time; managing a sales team during a period of transformational change for an organization, I focused on the northern territory and my partner on the southern territory. There are many other examples of projects and roles that require more than one full-time person in order to fulfill them, whether they are project based, management of different regions, commercial or operational based, they all centre around relationships. Far from being an exception to the rule, full-time and part-time employees should be educated, empowered, and supported to job share successfully. Imagine a workplace where as part of your professional or leadership development, you were expected to spend a period of your role in a job share; either with someone in a different department, or with someone from outside the organisation, or with a more senior colleague who is phasing out his or her work schedule for retirement. Perhaps with all of this evidence in mind, a new interpretation of job sharing will emerge, a repositioning which brings it into the comfort zone of “professional development” or “leadership development”. This way, organizations could refocus investment in leadership development towards supporting initiatives at work as opposed to “away days.” In doing so, organizations will be able to run leadership development harmoniously with flexible working strategies and realize the benefits of “sharing” at every level to create more effective, more successful, more productive, and more engaged flexible workforces.